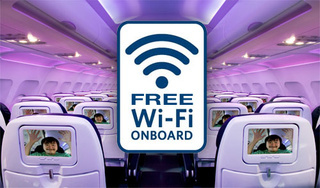 Home > Blog > Would you like to use free Wi-Fi on the Flight? Would you like to use free Wi-Fi on the Flight? What do you do while you are on a plane and waiting to reach your destination? Majority of the travelers prefer to sleep through if the flight is for 8 or 10+ hours. But in case of short flights you can’t do that. Usually there isn’t much else that you could do. But it’s about to change now. There is going to be an addition of Wi-Fi facility for European Airlines. This will be an amazing change and a way to distract yourself with internet surfing. You may indulge yourself in anything like games or news or social media etc. Also if you are traveling with kids you need not watch over them the entire time or keep telling them to hush because there is nothing else for them to do other then talk. Now they will have something to do and this will allow you to relax and enjoy your journey. But there is a catch. For now the Wi-Fi is only being introduces in the short distance flights. But let’s be hopeful because if everything goes fine, there will be a Wi-Fi in long distance flights too. Then people like me who are just unable to sleep in a plane will not be bored to death for hours. This increment will not only facilitate the passengers but also stands to bring revenue to the airline. There is a bit of competition between them to be the first to introduce this in their flights. They intend to administer proper advertisement campaigns to advocate their services. With all this effort they are anticipating to attract more passengers and consequently boost the business. The idea will take some time before it is visualized but still it is good to know that it is going to happen soon. If you are planning to fly out in near future do inquire if your airline is providing the Wi-Fi or not. The traveling will not be as boring as before now for the travelers of any age group. But never forget to make proper parking arrangements for your vehicle or you will not be able to enjoy anything. You can also avail the amenities of UK Airport Parking Deals and make your journey even more yielding. Previous PostThe Fervencies of Facilitated Travel via Meet and Greet Parking.Next PostHow to Manage a Perfect Travelling Plan? You are so amazing. You know significantly on the subject of this subject, made me in my view believe it from so many various angles. Your individual stuffs nice. All the time care for it up!